DEL MAR — The third time was the charm for KAABOO organizers. The 22nd District Agricultural Association board of directors at the April 12 meeting approved a contract to host the three-day music and arts “mix-perience” at the Del Mar Fairgrounds for potentially the next 10 years. “Needless to say I’m incredibly excited about the outcome and really grateful to the fairgrounds and, more importantly, for the outpouring of support from the community,” KAABOO creator and CEO Bryan Gordon said after the 8-0 vote. The 22nd DAA, which governs the fairgrounds, received 80 emails of support from residents, hoteliers, restaurateurs and other businesses and nonprofit organizations that benefited from last year’s event. Some were among the 17 speakers at the meeting who praised the event and urged directors to approve the contract. “I live in Solana Beach a hop, skip and a jump away from here and I have to say in my entire life my most favorite event that’s ever happened on these grounds is KAABOO,” Maria Assarat said. Bob Harter from L’Auberge Del Mar said the upscale hotel booked 300 rooms at an “elevated rate” during the off-season. Sheila Zabel from Del Mar Inn said she hopes KAABOO grows and adds a second weekend. Del Mar resident Anne Farrell lives in the hillside community just south of the fairgrounds and works for Voices for Children, one of the nonprofits that received funding from the 2015 event. “I heard it a little bit last year but it was not a problem,” she said. Despite all the positive feedback, the inaugural event was not without its problems. A hotline received 91 calls, nearly all complaints about loud music on the final day. High heat, wind and humidity created the perfect storm for sound travel, resulting in noise complaints from people more than three miles away in Carmel Valley and Del Mar Heights. This past December Del Mar officials began a process to enforce the city’s rights under a 2013 settlement agreement for noise violations at the state-owned facility. The city shared its concerns and objections to the contract in a letter received by the 22nd DAA on April 11. Director David Watson said the issues were addressed and compromises were made during an “amazingly positive meeting” of the Community Relations Committee held hours before fair directors met. 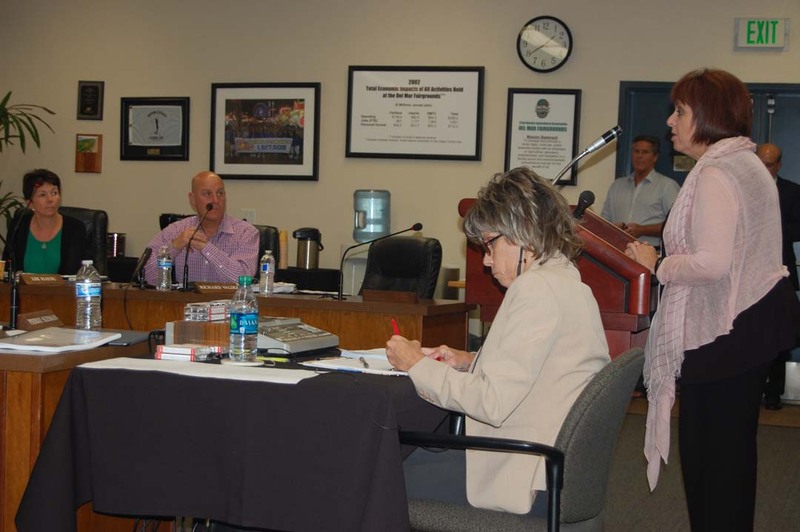 KAABOO must adhere to Del Mar’s noise ordinance and coastal permits issued to the fairgrounds. “They’ve agreed to do that,” fairgrounds General Manager Tim Fennell said. Organizers will be fined $1,000 for each violation up to a maximum of $10,000 per event and $150,000 per year. The fairgrounds can terminate the use of sound-producing devices that result in violations. Jim Dorroh, production manager with Leo Events, described other changes. Dorroh said output levels will be reduced and performers will know where the cap is so they don’t exceed it. He said stage layouts were adjusted so they point into the fairgrounds and away from Del Mar. There will also be a monitoring system in the neighborhoods with real-time information feeding back to engineers at the fairgrounds. “We’re not going to wait until we’re not in compliance to do something,” Dorroh said. It featured more than 100 performers on seven stages with music by No Doubt, Killers, Snoop Dogg, Foster the People, Neon Trees, Train and Counting Crows, to name a few, comedians, upscale dining, an art fair, and an area that offered massages, henna tattoos and hair and nail services. The 2016 event will be held Sept. 16, 17 and 18. So far the lineup includes the Goo Goo Dolls, Jack Johnson and comedians Dana Carvey and Darrell Hammond. Ticket prices are the same, with three-day passes ranging from $249 to $2,499. The contract was scheduled to be approved in February and March but action was deferred to work out noise and other issues. The initial agreement with the fairgrounds is for five years with five one-year options, with an annual lease payment of $1,150,000. Based on last year’s event the district expects to net about $5 million for the initial five-year agreement and more than $10 million over the 10-year term, Fennell said. “I think that’s a conservative number,” he added. If KAABOO reaches a three-day average of 60,000 people the fairgrounds will receive a $25,000 bonus. If attendance hits 65,000 or 70,000 the district will receive $50,000 or $70,000, respectively. KAABOO is responsible for all security, medical and association labor costs. The fairgrounds will provide janitorial services, parking and traffic control. The first net profit of $300,000 in parking will go to the 22nd DAA. Anything beyond that will be split 50/50 with KAABOO. “Last year we took a chance on KAABOO, and as with everything there’s a learning curve,” Director Fred Schenk said. “I want to applaud you for learning from last year’s experience. “I’m glad to hear that this year not only do you have your hand on the knob but you really have your finger on the pulse of what this community is looking for,” he added.